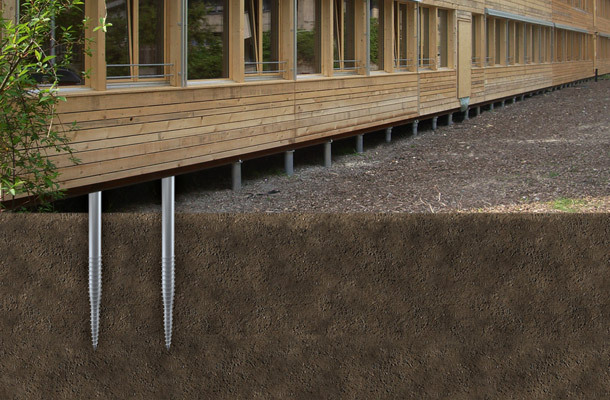 Krinner ground screw is the ideal ground foundation for timber construction. The land remains unspoilt and the installation process requires minimal activity. This means that the construction process can be effectively planned. Timber-framed buildings, such as halls and hospitals. Using krinner ground screws for timber construction ensures a safe, fast and cost effective construction programme. The krinner ground screw foundations provide an efficient design and build construction process, as the reduced site activity enables a programme that is easy to plan and manage. Completely and easily removable, with minimum impact to the landscape.